Are you an alumnus of the English Department? If so, we want to hear from you! Please fill out a short form by following this link. We would love to feature your update in an upcoming edition of our alumni newsletter. Be sure to check the appropriate box in the survey to give us permission to do so! The Department of English is committed to students—both today’s and tomorrow’s—and we appreciate your support in helping us develop new curricula, extend outreach, expanding current educational opportunities, and support students and faculty. 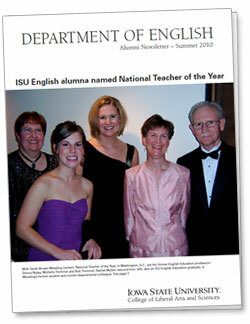 Please consider making a gift to the ISU Foundation to benefit the English Department at Iowa State. When you choose to donate, you can decide which programs, funds and fellowships your donation will help fund.